You do not have to be "artistic" to enjoy and create beautiful, lasting outdoor mosaics. 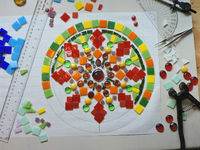 This is a fun and comprehensive workshop where you will learn basic mosaic design techniques, appropriate substrates, material,adhesives, grouts,Etc.. Most importantly - how to protect your creation from the seven threats to weatherproofing! At Panorama - GreenGlade. Four Wednesdays, 10-2:30, Please register directly with Panorama.